The “tour de force” of the Messianic Jew or Christian missionary is often the use of Isaiah chapter 53 in the conversion of Jews to ‘Yeshua’ or “Jesus” respectively. The use of Isaiah chapter 53 sometimes works on the unsuspecting secularized Jew in the culturally ‘Christian’ western world. 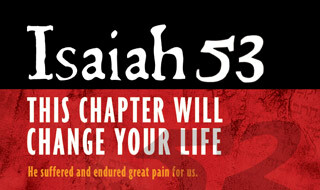 The use of Isaiah chapter 53 only sometimes works because of the Messianic Jew’s or Christian missionary’s basis for proof lies squarely in the evidence and validity of the New Testament (NT) or Brit Chadashah, which even those most assimilated Jews with a good amount of self esteem knows to avoid like the plague. Christians’ lack of successes in converting Jews are often because of taking the NT statements at face value without asking in what particular sense Isaiah’s prophecies of the servant of the L-rd apply to Jesus which is a next phase in the missionary approach. The next phase in the missionary approach teaches that the death of Jesus is the universal vicarious substitution for the death penalty which all sinners deserve. The earliest ‘biblical’ expression of a vicarious substitution for universal sin ONLY occurs within New Testament and not within the Hebrew Bible. It is however, the Christian’s prior doctrinal commitments projected onto and applied to the Hebrew Bible in general and Isaiah 53 in particular which Christians assume is G-d’s message to every sinner and to the Jews especially. If the first person plural language in the above is taken universally, then the servant of the L-rd necessarily must be Jesus, because nobody else but Jesus bears universal sin. But within the biblical context of the prophecy, the “we” is not universal. In context, the “we” is in the mouth of the non-Jewish kings who have despised and taken advantage of Israel in exile. The kings whose report of Israel’s success would not have been believed had the kings (see chapter 52) not seen Israel’s ultimate success with their very own eyes. In view of context, if the “we” of the prophecy is not referring to all sinners ever born on planet earth, then the suffering servant is not Jesus or necessarily any would be messiah. Israeli kids learn Isaiah 53 in school, along with all the rest of Isaiah. Israelis know chapter 53 goes with the rest of the book! It may well be only people unfamiliar with the Book of Isaiah, ‘Christianized’ people who have read only chapter 53, who jump to the conclusion that this is all about Jesus because secular Jews who participate in Western civilization are for all intents and purposes culturally Christian. 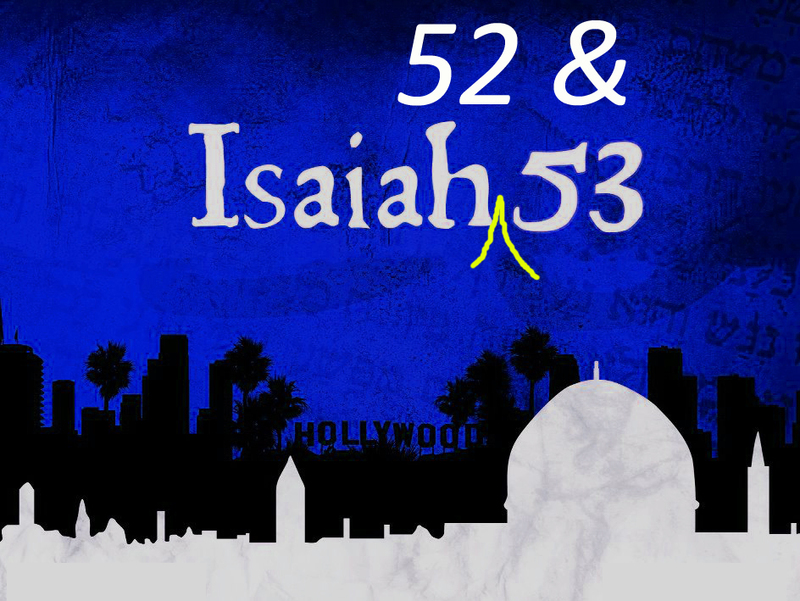 Some Jews who are won over to the Christian understanding of Isaiah 53 are therefore, being won over to majority Christian culture, rather than to fulfillment of Bible prophecy or simply because of a lack of self esteem and/ or lack of Jewish identity. Taking a look at context, Isaiah 53 obviously prophesies that non-Jews will someday repent of their mistreatment of Israel, recognize that in God’s mysterious plan Israel’s sufferings have been to the benefit of others, and acknowledge that Israel has been the true servant of God all along. The problem however, is with those ‘Jesus glasses’ on, seeing Israel as the true servant of God certainly is not obvious to many non-Jews! Certain of the prophetic specifications, which Christians often view as pointing exclusively to Jesus, are in fact borrowed from biblical descriptions of Israel’s experience. For example, in Isaiah 53:7 the servant of the L-rd is said to be like a flock led to the slaughter. In Psalms 44:22 Israel is said to be like a flock led to the slaughter. To give another example, Isaiah 53:11 says “my righteous servant shall make many righteous.” We have just such an expression in the Book of Daniel regarding Daniel’s people Israel. Daniel 12:1b-3. To give another example, Isaiah 53:11 says “my righteous servant shall make many righteous and carry their iniquities.” This language comes from the operation of Israel’s sanctuary. It was the duty of Israel’s priests to carry the iniquity of others. Leviticus 10:16-17. Numbers 18:1 is also explicit in this connection. Carrying the iniquity of others is also a prophetic gesture. Ezekiel 4:4-6. During the exile, the children of Israel complain that their punishment is too severe, because they’re carrying the iniquity of previous generations. In order to end the exile, the L-rd calls his righteous servant to resume Israel’s original mission task of carrying the iniquity of others. This is what priests do, and Israel is a kingdom of priests (Exodus 19:6). The New Testament accounts relate numerous instances of Jesus healing people, but never is it told in the NT that he got sick in their place. If his work load and hiking itinerary is anything to go by, Jesus seems to have been a robustly healthy individual. If Jesus was characterized by sickness, the gospel writers do not note the fulfillment of prophecy. Hiding the face from others is the behavior proscribed by the Torah for a leper (Leviticus 13:45). We have no record of Jesus hiding his face. In fact, Christian teaching emphasizes the opposite: that Jesus is the disclosure of God; that in seeing Jesus’, God’s face is seen. Within the framework of standard Jewish interpretation the statement makes good sense. If “my people” refers to the said king’s misbehaving subjects and “them” refers to the children of Israel, the prophecy is then saying that the L-rd plagued his servant Israel on account of these other people’s rebellion. But if, as Christians commonly claim, “my people” refers to Israel, who then can the antecedent of “them” be? Can Israel be both the referent of “my people” and the antecedent of “them?” Of course, it is a biblical truism that when God’s people Israel misbehave he punishes them, but why would the prophecy bring that up in connection with vicarious substitution? It is not vicarious substitution when people get what they deserve. Unless Jesus is the antecedent of “them,” it is difficult to construe this statement as referring to Jesus. Another particular which does not easily fit, if the servant of the L-rd is Jesus, comes in verse 10. Unless you believe Dan Brown’s Da Vinci Code, Jesus did not produce offspring and he did not enjoy a full lifespan. Some Christians have argued that since Jesus is God and God is infinite, that Jesus enjoys prolonged days. Infinity however, is not what the Bible means by prolonged days. The Bible never attributes prolonged days to God. Furthermore, in the prophecy the servant’s prolonged days are predicated on the L-rd crushing him with sickness and making his soul a guilt-offering. God’s infinity is not predicated on what he does to his servant. The above difficulties give at least a plausibility to the Jewish position that the servant of the L-rd in Isaiah 53 is Israel rather than Jesus. 1. See Acts 8:35, Luke 22:37 and Matthew 8:17. 2. Romans 5:18; John 1:29 and 1 John 2:2. 3. The goat [of the Day of Atonement] that was sent [into the wilderness] (Ley. xvi. 20, seq.) served as an atonement for all serious transgressions more than any other sin-offering of the congregation. As it thus seemed to carry off all sins, it was not accepted as an ordinary sacrifice to be slaughtered, burnt, or even brought near the Sanctuary; it was removed as far as possible, and sent forth into a waste, uncultivated, uninhabited land. There is no doubt that sins cannot be carried like a burden, and taken off the shoulder of one being to be laid on that of another being. But these ceremonies are of a symbolic character, and serve to impress men with a certain idea, and to induce them to repent; as if to say, we have freed ourselves of our previous deeds, have cast them behind our backs, and removed them from us as far as possible. CHAPTER XLVI, THE GUIDE FOR THE PERPLEXED, BY MOSES MAIMONIDES. That is a good aurgument, and Platoism is a big problem not only in the West, also in the East, The exceptance of Hellenism. This verse from Isaiah completely undoes the Christian claim to JC being the chosen Servant of God i.e., the Messiah. Collective Israel aka Jacob, is God’s chosen servant. No one else. yes…the suffering servant is Jacob and his offspring……..want to see how they suffered just in the past 100 years?……..go to W,DC and see the Holacaust Musuem………now that is suffering!………….it will chill your soul when you see what those N did to Jacob,,,,,,,,,,,they did more than pierce Jacob’s side! I can go to yad vashem here in Israel where I live. And why would you think I do not know what has happened to my people? I think what is missing here Menashe is the fact that this “Christian” view was first and foremost presented by Jews. Were it not for the fact Jews believed Yeshua to be the suffering Servant, it would in no way ever have reached the Nations for them to believe. Pagans could not have come up with the concept presented in the Mosaic law that a sin sacrifice was required for sin atonement by the LORD. It is an issue that Rabbinic Judaism has to argue away since obedience to the law can no longer be fulfilled since 70 CE. The Rabbis lamented the the fact the Temple was destroyed yet Messiah had not come as Daniel prophesied. Something that has to be explained away by Rabbinism. Once again, no one will explain why we have this terrible judgement to come upon the Nation even in our days. How tragic. “Let few of you be teachers”, Jacov told the Jews of the time of Yeshua, “as their judgement would be harsher.” How much more does it apply to this generation that stands on the brink. The writers of the New Testament (see Hebrews 10) would have us believe that the New Covenant of Jeremiah 31 was fulfilled by Jesus’ incarnation, crucifixion, resurrection, or ascension 2000 years ago. The New Covenant of Jeremiah 31 is however, in the future, in a messianic age. During the times of Jesus, there was no House of Israel in existence because Assyria had exiled the Kingdom of Israel more than 700 years earlier (approx. 732 B.C.E.). Moreover, in the first century CE the Jewish people were spread throughout the Roman Empire and beyond. Thus, even the “House of Judah” was not all in the Promised Land during the times of Jesus. The giving of the New Covenant to the “House of Israel and the House of Judah” (v30) is obviously referring to a future event that clearly indicates that Jeremiah is speaking to a restored and fully ingathered people. 7 Behold, I will bring them from the north country, and gather them from the uttermost parts of the earth, and with them the blind and the lame, the woman with child and her that travaileth with child together; a great company shall they return hither. Once again Menashe this prophesy comes and will be fulfilled at a time of great judgement on the Jewish people which you continue to fail to give an explanation for. You of course are at liberty to reject Yeshua who is the only Jew who turned the hearts of the Gentiles (few who truly came to know the God of Israel), towards the God of Israel as the Hebrew prophets proclaimed would happen. You have been called to be a light to the Gentiles. I’m interested how you are fulfilling this call on your life as a Jew since you reject that which the 1st century Jews did in bring the besorah to the goyim. Mark of course there will be a great judgement for the Jewish people. The mechanism for judgement has not changed. Unfortunately, Christianity and the NT propose a new mechanism: believe in a divine messiah that does it all for you. The Torah provides the details of the mechanism for judgement very succinctly. Perhaps you could furnish me with what you see as being a light to the Gentiles, when that light has been repeatedly murdered, persecuted and defamed for 2000 years.? who is the (mebasher) with good tidings but for messiah ? the lord said that he will bare his holy arm to reveal his salvation — the salvation is done by the coming messiah – right? but there is aproblem still — there r older traditions (before rasi with centuries) that illudes this holy prophecy to the messiah – will we just ignore that as if to werent there !? your quotations against mine – who is winning — i think that the older traditions the better is he >> right? I have been reading much about the Jewish, I have come to the conclusion that the Tanakh is true, the only Bible to read..so much is different between the Tanakh,and the Christian bible, I was raised Baptist, all my life, I am nearly 60m next month, and have been out of the Christian church for about a year and a half. Pray for me.